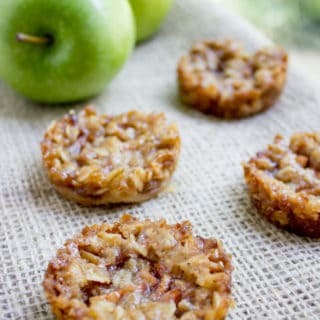 Apple Crisp Cookies with a pie crust bottom, sweetened spiced apples and a brown sugar and oat crust. Just enough filling to make it feel healthy! Add baking spray or grease regular muffin tin (you'll use it twice or spray two muffin tins). Cut 24 two inch circles out of your pie crust. If you need to gather your scraps and re-roll them to 1/4 inch thickness. Add the pie crust to the muffin tins. In a small saucepan add the apples, sugar, cinnamon, lemon juice and cornstarch. Cook for 5-7 minutes until the apples are softened and thickened. To make the crisp topping, add the flour, 1/2 cup sugar, 1/2 cup brown sugar, salt, oats and butter to a bowl and combine with either a hand mixer or pastry cutter. Add one tablespoon of apple filling to each muffin well. Add two tablespoons of the crumble topping on top. I give the tops a quick spray with canola oil, but it is totally up to you. I find it helps hold the topping together. Let cool completely before carefully removing.